Say the word “filibuster” to the average American, and one of two things is likely to come to mind: Senator Ted Cruz reading Green Eggs and Ham while trying to deny millions of Americans access to health care, or fictional Senator Howard Stackhouse standing up the rights of autistic children on The West Wing. Based on tonight’s events, which have already carried into the next day, a third filibuster may now enter the modern consciousness. As we speak, Senator Jeff Merkley of Oregon is still holding the Senate floor as the local time approaches 3:00am. He’s been at it all evening. He refuses to yield, because he’s just that determined to prevent extremist Supreme Court nominee Neil Gorsuch from being confirmed. 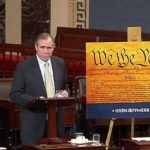 Merkley has the backing of his Democratic colleagues, who have more than the required forty votes to sustain his filibuster indefinitely, and they’re essentially daring Republican leader Mitch McConnell to break the Senate rules to shut them down. Merkley has plenty of valid reasons to be doing what he’s doing. The seat was stolen from President Obama and Merrick Garland to begin with. Gorsuch arrogantly refused to answer most of the questions Democrats asked him during the confirmation hearings. Gorsuch was nominated by Donald Trump, who is currently under FBI investigation to determine whether he conspired with the Russian government to rig the election in his own favor and could end up being impeached. And as was revealed this evening, Gorsuch has been busted for plagiarizing his 2006 book (link). But there’s more to it than that. Jeff Merkley isn’t up there reading a children’s book on the Senate floor just to randomly kill time while trying to prevent a vote from happening. Instead he’s been making an extraordinarily detailed case for why Gorsuch’s judicial record disqualifies him from the Supreme Court. Merkley keeps quoting one case after another, one flawed decision after the next.